"I remember even before my father left for Canada seeing how the cobblers lived. 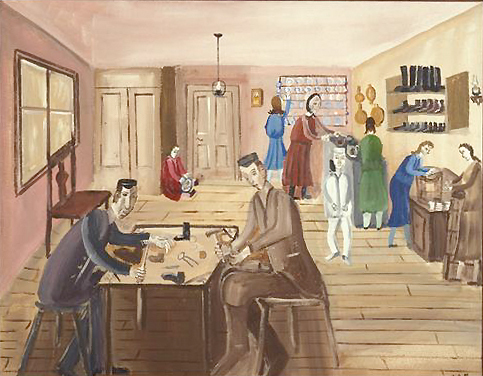 Our neighbor der shvartser Khiel, Khiel the Brunette, was a cobbler. Although he was a redhead and all his children were redheads, they called him Khiel the Brunette. To confuse matters further, they nicknamed a dark-haired Khiel in town der geyler Khiel, Khiel the Redhead. One day my mother sent me to Khiel the Brunette in the early morning on an errand. It was before they had a chance to rise. When I walked into that room, there were people sleeping everywhere, wall-to-wall, at the head and foot of the beds, on benches and tables, and on the floor. The whole family lived and worked in two rooms. In this painting, you can see all the action. The drinking water was in a barrel on the floor. The wooden bucket on the cabinet contained water for soaking the leather. Soaking makes the leather flexible. You can see all the tools and each step in the process of making a shoe. Khiel the Brunette had seven daughters. Every time a male child was born, something happened and the child died. Every Jews wants to have a son so that there will be someone to say Kaddish, the prayer for the dead, for him after his demise. In desperation Khiel the Brunette went to the Rabbi. He implored, 'Am I to die without a male heir? Who will say the Kaddish, the prayer for the deceased, after my demise? I have seven daughters. Can I afford another one? Where will I find dowries and grooms for them all?' The Rabbi thought for a while, and came up with a solution. He said, 'Go home. When your wife gets pregnant and it's a baby boy, do exactly what I tell you.' First, he gave Khiel an amulet and told him to make the boy wear it all the time. It would ward off evil spirits. Secondly, the child must always be dressed in white. The white clothes would fool the Angel of Death, the malakh hamoves, into thinking the boy was already dead and not taking him. Jews always bury their dead in white burial shrouds. A boy was born. Khiel the Brunette followed the Rabbi's instructions and the boy survived. When I left Opatów in 1934, the boy was eight years old. I was told that even as a teenager he still wore the white pajamas. He was dressed in white in 1942 when the Jews of Apt were expelled, never to return." Mayer talks about the cobbler Khiel the Brunette and his desire to find husbands for his seven daughters. Listen to it. To see and hear Mayer tell this story in Yiddish, click here and scroll down to the bottom of the page.